“Young Actors for Peace and National Reconciliation” is the title of the joint UNICEF-IOM-UNESCO project. It has been set up to accelerate the implementation of the agreement for peace and reconciliation in Mali (resulting from the Algiers process), through the operationalization of the new mechanism of the Regional Support Teams for National Reconciliation. (ERRNA), as well as through the involvement and empowerment of young people and women, in the implementation of the G5 Sahel Youth Strategy and the fight against cross-border trafficking and exploitation of young people. So far, most of the peacebuilding projects have been implemented in northern Mali, but today the center of the country also has a great need for conflict prevention and resolution. The project directly targets 2,500 young people, including 900 young women, from 25 communes in the regions of Ségou and Mopti. 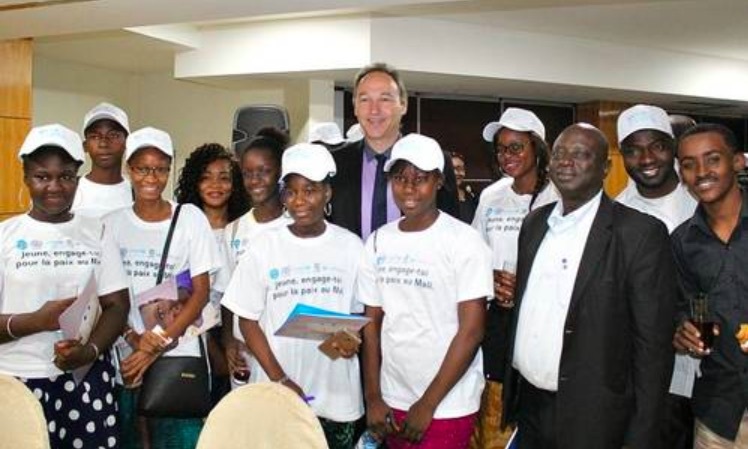 The project, officially launched on March 29, 2018 in Bamako, saw the participation of the Minister of Youth and Citizen Construction and Government Spokesperson, the Minister of Digital Economy and Communication, the Secretary General of the Ministry of National Reconciliation and Social Cohesion, MINUSMA, UNESCO, UNICEF and IOM. There was also the participation of several youth associations including The National Youth Council (NYC), the Youth Association for Active Citizenship and Democracy (AJCAD), the Children’s Parliament of Mali and the Association for the Promotion of Children as Journalists and Communicators (APEJEC). The participants and the young people, together with the personalities present, emphasized the importance of the dynamics of the culture of peace and social cohesion in order to avoid the risks of conflicts. Mr. Amadou Koita, Minister of Youth and Citizen Construction, and his counterparts in communication and national reconciliation, thanked the technical and financial partners, including MINUSMA, who believed in the capacity of youth to promote peace and social cohesion. They have demonstrated their commitment and support in this project that fits perfectly with the vision of the highest authorities of the State. “My counterparts here and I will accompany you in this noble initiative, because all these actions prepare young people to play their role, which is important, in the implementation of the agreement for peace and national reconciliation. Algiers process, “he stressed. In her address, Ms. Lucia Elmi, UNICEF Representative in Mali and spokesperson for the three agencies, reminded that the future is about youth, and that it is through young people that can be built a lasting peace. Convinced that through this project, young people will be able to give their opinion and positively influence the search for peace while ensuring the prevention of conflicts, she also stressed that this project will make it possible to popularize the agreement for peace and the national reconciliation resulting from of the Algiers process. Finally, it will add: “by investing in young people, so that they become peacemakers, actors for peace, we guarantee a better future for this country”. Funded to the tune of 1.4 billion FCFA by the Peacebuilding Fund of the Stabilization and Recovery Section of MINUSMA, this project aims to strengthen the engagement of young people and women in as actors of peace in order to strengthen social cohesion, community dialogue, living together and developing the potential of young people.